If you’ve been here, you know how yummy the food is! Here’s a few of our favorite recipes. I found this great thread on Lamb’s Quarters on my search for information and recipes on these beautiful strong plants …. 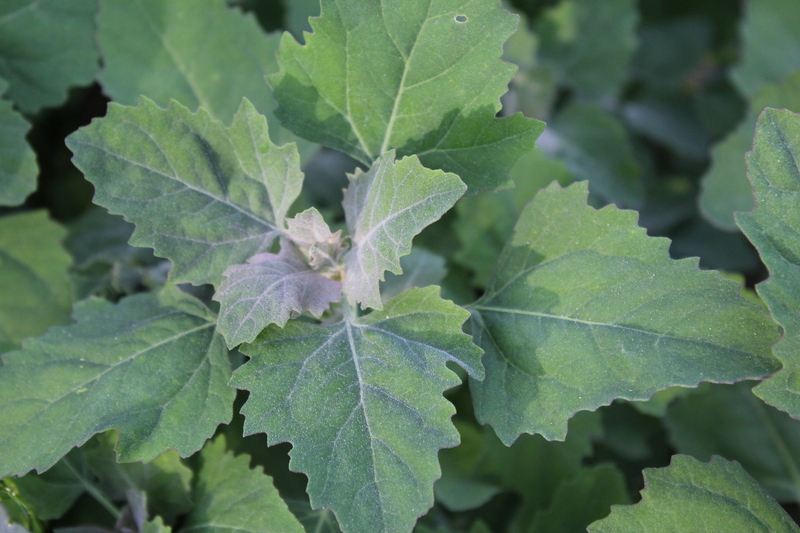 Chenopodium album: also called lamb’s quarters, white goosefoot, fat hen. 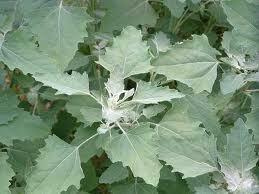 This is a common weed that is one of those marvelous wild plants that’s completely edible, delicious and nutritious. Use it where you would spinach, raw or cooked. It can be eaten raw in salads, pasta salads on sandwiches or use in soups or stir-fry. Steam it like spinach and serve like a side dish or put in an omelet or lasagna. It is quite versatile as a garnish and the mild flavor blends well with other vegetables. adapted From THE WILD VEGETARIAN COOKBOOK Lamb’s-quarters greens are better than spinach, a close relative, both for flavor and nutrition. And it contributes greatly to the flavor of this spread. julia’s note: this was a big hit with the three adults at table. I highly recommend this recipe! We ate it with cucumber slices. You could eat it with crackers, or as a sandwich spread or a pasta topping. 1. Chop the garlic in a food processor or by hand. 2. Add the onion and chop. 3. Add the remaining ingredients and process or chop until finely chopped. Lamb’s-quarters Spread will keep, tightly covered, in the refrigerator for 5 to 7 days. Cook up onions in butter til wilted, add flour and cook up til mixture browns a bit. Add S & P. Cook for a few minutes over medium heat. Add milk and lambs quarters. Then heat gently and eat ‘chunky’ or whirl with an immersion blender or in a food processor. Simple and yummy. If you don’t want to use 3 Cups milk, you can use vegetable or chicken broth and a potato or two. Partially bake pie crust at 450 degrees for 5-7 min. or until light brown. Reduce heat to 325 degrees. Cook onion and leaves until tender and limp. Stir in flour and salt. Beat together eggs and milk; add vegetables. Sprinkle cheese in pie shell; pour in eggs. Bake 40-45 min. or until knife comes out clean when its inserted off center. Let stand 10 min. before serving. 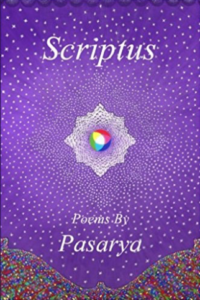 Orgin of Recipe : Offered by Carla J. Striegel… who learned this from learned through an urge to live simply and organically. Lamb’s Quarter is a common, non-native weed in waste places. If you are lucky, it grows in your garden. Although this recipe is really not too exciting for someone already familiar with this excellent green, I couldn’t help but share it with those who have never tried it. It is my absolute favorite vegetable. Gather any of the tender leaves and stalk–I prefer to let some keep growing in my garden and keep its tender shoots well trimmed. It is also nice to use the small plants that you have just weeded from around your “garden plants”. Steam these greens for several minutes (less than ten minutes, because you do not want them mushy). Remove the greens from the steamer and place onto serving dish. Pour a dash of olive oil onto each serving. Top with minced fresh garlic and a bit of Bragg’s. Voila, you have the best meal this world could offer! 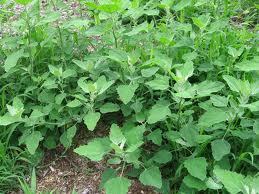 Note: Lamb’s Quarter is a very common “weed” that is extremely nutritious. The seeds are also edible. 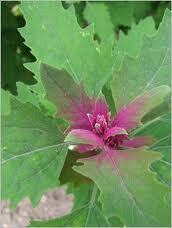 To learn more about the plant, look in almost any book about wild edibles. In Mexico, these greens are called quelites (as are many other edible greens). According to Rick Bayless’s Mexican Kitchen, the word derives from the Aztec word quelitl, which was used for any culinary green or herb. Since my first introduction to the use of lamb’s quarters was by Bayless in Mexican cuisine, I cooked my bunch of lamb’s quarters in two Mexican dishes. The first was in soft tacos, with the greens lightly steamed and topped with hot sauce and cheese. The second was in a tortilla casserole, combined with cheese, corn, squash and crema (a relative of sour cream). The greens were excellent in both dishes, with a pleasing tenderness, a mild spinach-like flavor and none of the lingering astringency that I find in spinach. This recipe is one of my favorite breakfast recipes, but of course it would work at any time of day. Please note the amounts given are approximate, I don’t measure anything when I make these. You could use more or less of any one of these ingredients. Heat the oil and add the garlic, having the greens ready to go, and cook garlic for about 30 seconds. Then add greens and cook until bright green and wilted, add red pepper (and salt and black pepper if you like). Take off heat and stir in cream cheese. Heat tortillas, divide filling among them. Eat and enjoy. Rinse greens several times to make sure that all sand and grit are removed. Steam greens in tightly covered pot until wilted. Drain greens and finely chop them. In large skillet, heat oil over medium heat. Add garlic/onions and cook, stirring frequently, until leeks are soft, 2 to 3 minutes. Stir in greens, beans and chili powder. Cover and cook over low heat for 5 minutes or until heated through. Season with salt and pepper and serve. Makes 6 servings. Black Bear Soup: a recipe using roots, sausage, and lambs quarters or other wild greens, also on the BobCatsWilderKitchen website. Blanch the lamb’s quarters in boiling, salted water for 1-2 minutes. Drain, reserving blanching water. When ready to use, heat a large skillet and add a little olive oil. Add the lamb’s quarters, a little salt, and a little of the blanching water. Heat through and finish with a little lemon juice and some more olive oil. Serve warm as a side dish or under your favorite meat/fish. If using the optional garlic or shallots, add those for a minute before you saute the lamb’s quarters. Blanch the lamb’s quarters the same way, then drain and chop them. Mix with some eggs for a Lamb’s Quarters Scramble.